You use the Transport Themes tool to import and export themes as compressed files. Go to System Administration >Transport >Transport Themes. Your custom themes are listed under Export Themes. To export a theme, choose the theme to be exported and specify a target folder for the compressed file. Specify the path to the theme that you want to import or choose Browse to select the compressed file of a theme. If you want the imported theme to overwrite existing themes, select Overwrite Existing Theme. 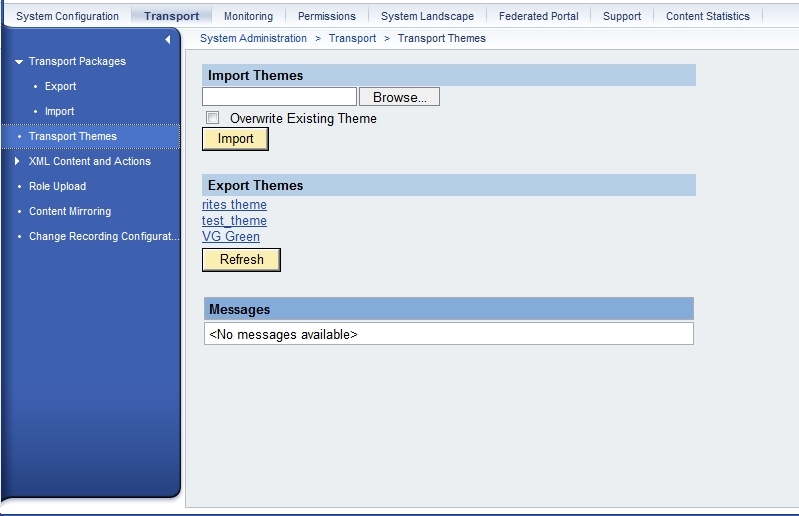 You can also transport themes by including them in a standard portal transport package. For more information, see Transporting Portal Objects.